NYC protesters continue to stand with Gaza | Fight Back! 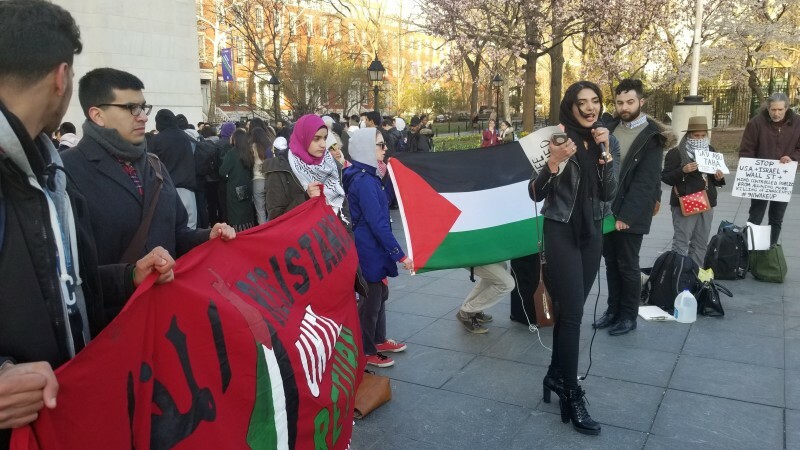 New York, NY – Around 30 protesters gathered in Washington Square Park, April 20 to stand in solidarity with Palestinians protesting on the border of Gaza. This is the fourth week in a row that protesters have gathered to support their allies abroad during the Great Return March. The protest was called for by the group Within Our Lifetime. Palestinians have said that they will march for six weeks leading up to Nakba Day. In the middle of the rally, a contingent of activists from a different protest joined in solidarity. The other protest was for the deportation of human rights activist, Jerome Aba. Aba was detained by the U.S. government for 24 hours before he was deported. During this time, he had to suffer inhumane treatment and torture. The two groups began chanting together and the speeches drew connections to both causes. Jessica Schwartz, an organizer with the Committee to Stop FBI NYC, said, “It is extremely fitting that the women’s committee put out a call for action, because women are often times at the forefront of struggle and face added violence under imperialism. The protest ended with a group picture and chants that spoke towards the further liberation of Palestine.